"Don't Practice until you get it right, Practice until you can't get it wrong"
Our Player Development Initiatives (PDI) evaluates players based on the four (4) major components of the game (Technical, Tactical, Mental & Physical), along with USSF (United States Soccer Federation) and USC (United Soccer Coaches) player development standards and created a development program with clear benchmarks based on a player's age and ability. This is a unique way of helping developing youth soccer players. Our PDI Program has four (4) badge levels or grade levels: PDI Badge levels are Select, Elite, Premier & Showcase. 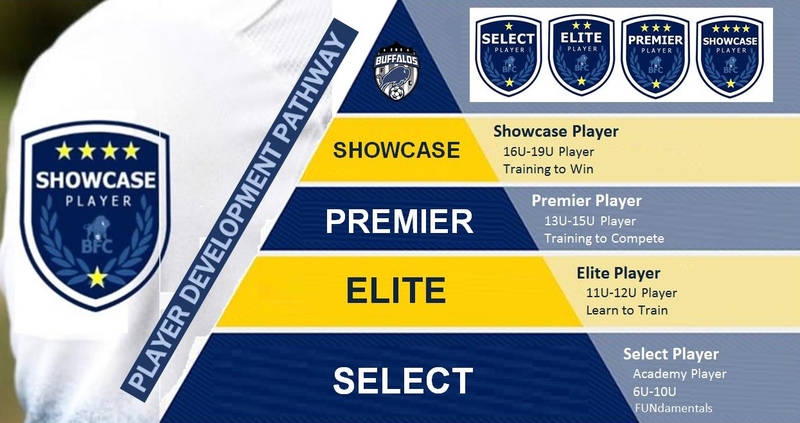 Each badge level means a player has achieved a "grade level" in their development. Players get to wear their PDI badge on their game jerseys and practice jerseys, etc. BFC coaching staff also uses badge levels to help determine player placement / team assignments each year. The program is simple, players who put in the work to improve their technical, tactical, mental and physical skills/ability will progress to a higher level team quicker than a player who does not. This program provides a clear road map to success and rewards, motivates, and identifies areas a players needs to improve. No more soccer politics in the player placement / team assignment process - players who earn a higher badge are eligible for promotion to a higher team. Allows a player to set their own development path and goals. Makes it easier for parents, players and coaching staff to identify where players need to improve.